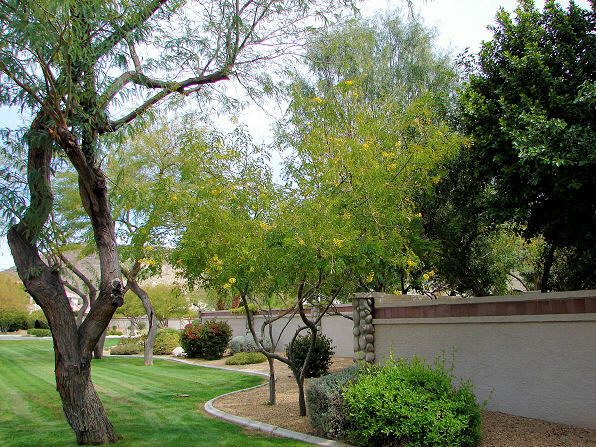 The Cascalote Tree is a great xeriscape plant. – aka Caesalpinia cacalaco, Synonym:Russellodendron cacalaco, Coulteria mexicana, Poinciana horrida Fabaceae. 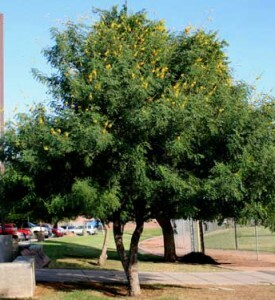 The Cascalote tree produces large spikes of light yellow flowers in most of winter and attractive copper-colored pods. It is native to Mexico and does very well in the Arizona desert. The Cascalote will make a nice patio tree. It is slow growing and only reaches at most 20 feet tall. It can be pruned to shape and thin. It will suffer some frost bite if temperatures go below 20 degrees. This tree does best in full sun with well drained soil. Looks very much like the Mexican Bird of Paradise but larger.